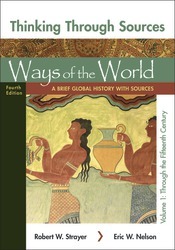 Designed as a companion reader to accompany Ways of the World, each chapter of Thinking through Sources for Ways of the World contains a Thinking through Sources project of six to eight carefully selected written and visual primary sources organized around a particular theme, issue, or question. Each of these projects is followed by a related Historians’ Viewpoints secondary source feature, which pairs two brief excerpts from historians who comment on some aspect of the topics covered in the primary sources. Each source feature is accompanied by incisive questions to guide students’ skillful examination of the sources. Headnotes and questions to consider before each document help students approach the documents, and essay questions at the end of each chapter provide a starting point for classroom discussion or a written assignment. Thinking through Sources for Ways of the World is FREE when packaged with Ways of the World, and is included for FREE with ACHIEVE: Read and Practice, and in the LaunchPad for Ways of the World. In LaunchPad, innovative auto-graded exercises accompanying the Thinking through Sources projects supply a distinctive and sophisticated pedagogy that not only help students understand the sources but think critically about them. Thinking through Sources for Ways of the World is also available to customize through Bedford Select.